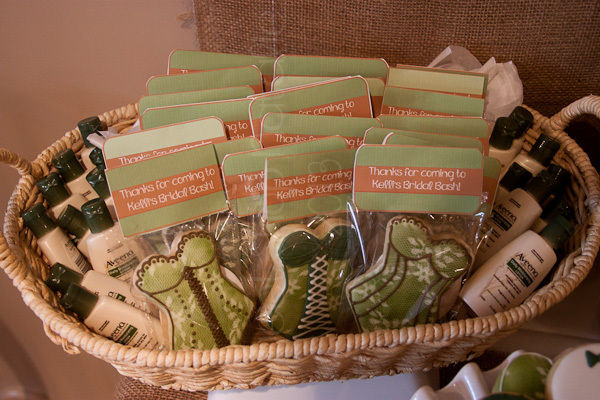 My good friend, Kelli, is getting married in two weeks and I got to host her bridal shower last week. 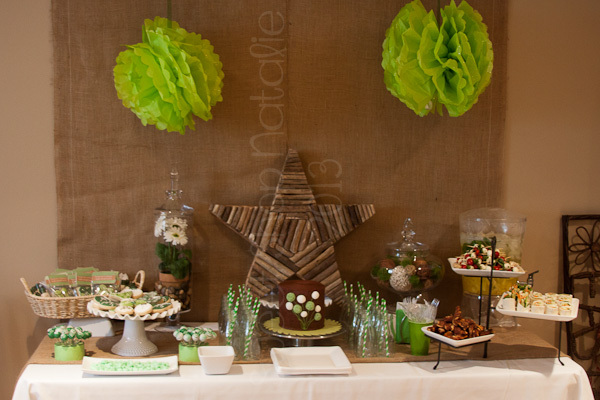 I worked all week on the decor and making almost all of the food for the refreshment table. It was fun and a little stressful, but it turned out well and most important Kelli's friends came to celebrate her getting married to the man she loves! 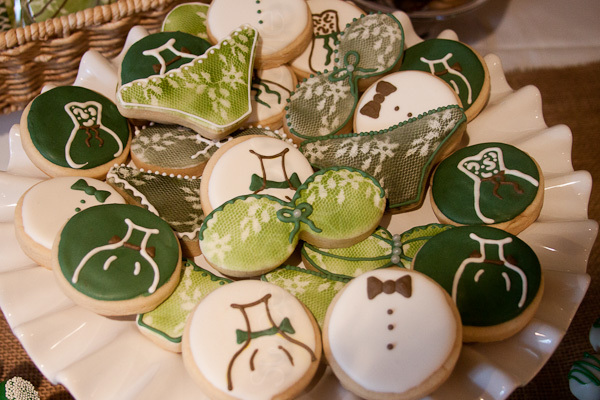 First off lets look at the cookies, of course there would be cookies. This collage I did for the purpose of Lila Loa's challenge to photograph cookies in a new way. I always takes pictures with just a white back ground so this time I used green tissue paper. I think they actually look good maybe I will try other stuff more often. 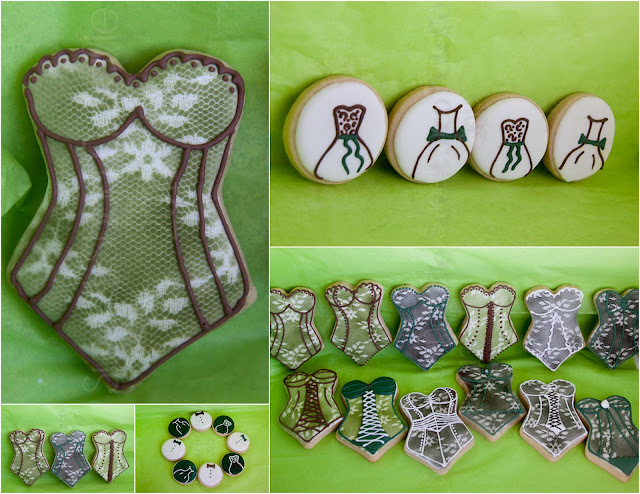 When I saw Sugar Nosh Treats post her easy way of airbrushing a lace design, I knew it would be perfect to do for the lingerie cookies I planned for the shower. 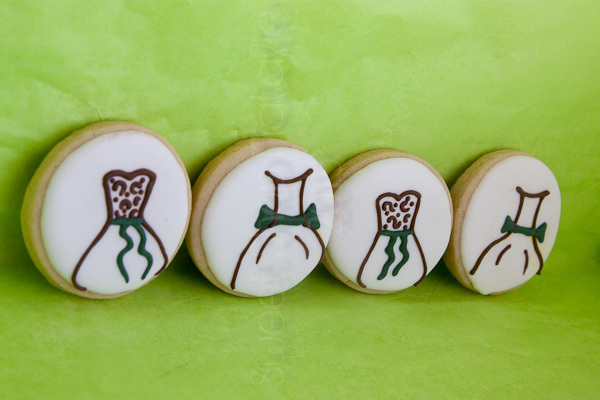 These larger ones I made as party favors for each party guest. 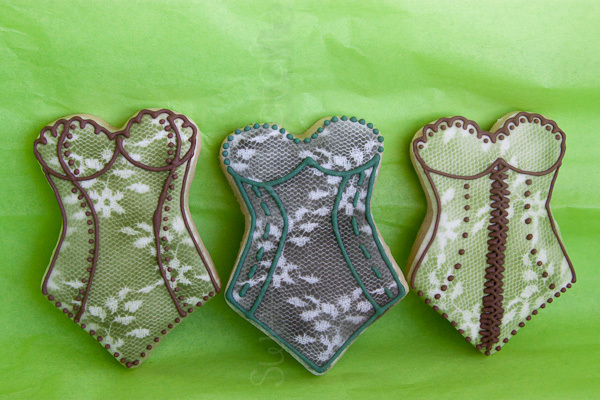 I also made some smaller cookies to have out on a platter. 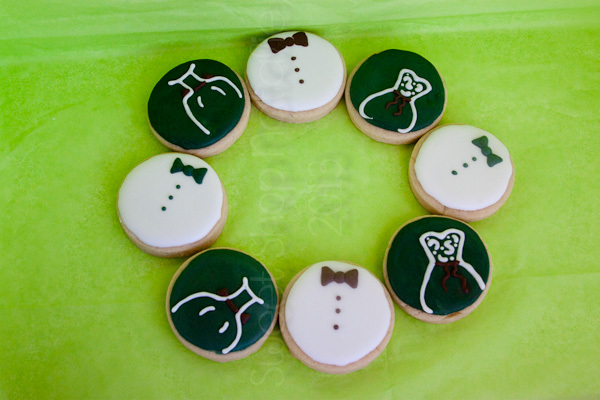 I saw some bride and groom cookies on the web some where a month or two ago and I thought it was such a cute idea. I have been trying to find those pics again but have not been able to find them so if you know who did them let me know so I can give them credit. 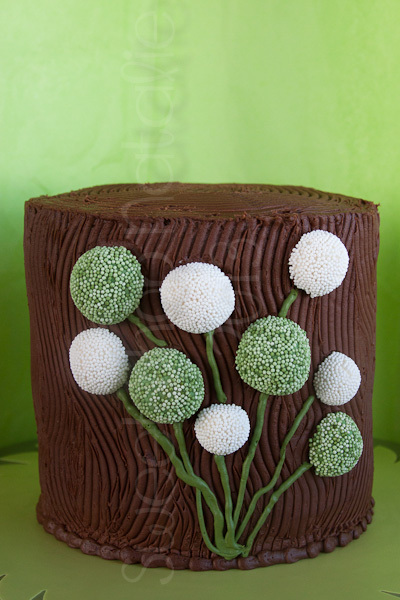 When I saw Mycakeschool.com's Billy Balls cake tutorial I knew it would be perfect. This is my chocolate version. The next pictures are from my basement family room, where the light is not the best so they don't look so hot. 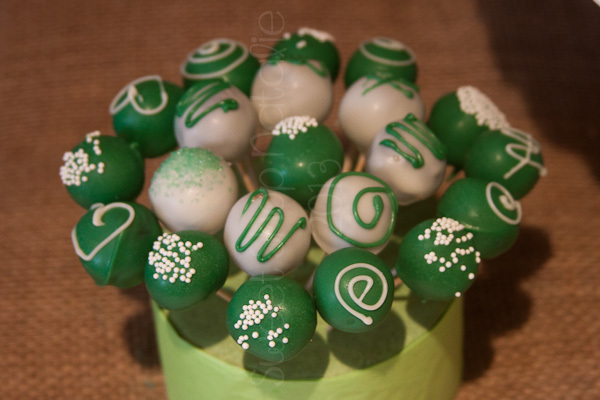 Yummy mini chocolate coconut cake balls. 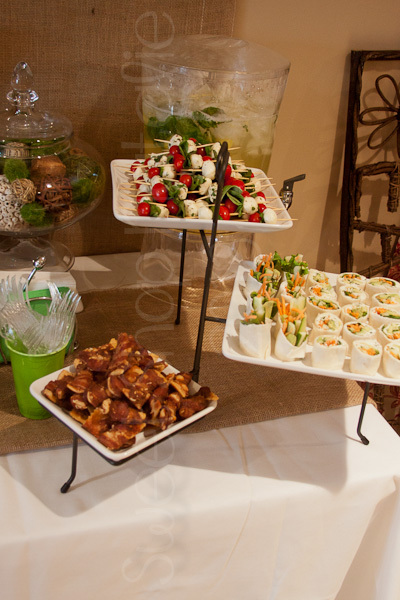 Savory side, Pioneer Woman's bacon appetizers and prairie sushi. Mozzarella tomato basil skewers were furnished by my friend Kim and I was so thankful for her help and they were so good, and I was so happy to polish off the leftovers! Oh and tucked behind the skewers was the drink, it was pineapple mint water. It was so delicious. No sugar just flavored water. I loved it! 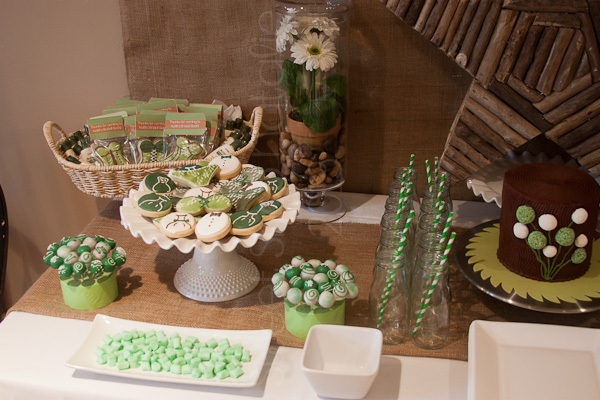 The burlap, green and white scheme looked really good together and thanks to my friend Kylie, she let me shop through her house and borrow some of her decor and serving dishes for the day.